If you have problems downloading & printing the PDF, please email us. You may enter using our 2019 online registration link available soon! Please read BOTH the Rules and Entry Form information before entering online to assure your routines (Age, Ability Level and Dance Category) will be correct in our program. 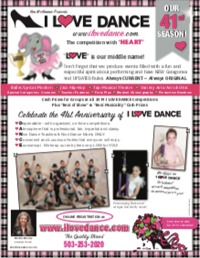 You may enter using our convenient online registration: www.ilovedance.com. Please read BOTH the Rules and Entry Form information before entering online, to ensure your routines (Age, Ability Level and Dance Category) will be correct in our program. Fees must be sent in U.S. Funds and sent overnight mail with return receipt, to assure you that we have received them. Entries must reach our office 30 days prior to event date to avoid a late fee. Enter as early as possible — many cities fill up quickly. Once entries have reached our office by mail, online registration, or by phone, all fees are due and payable. No refunds will be made due to cancellation by Participants, Teachers, Parents, or Studio Staff. The following rules apply to step ingredients. If you have any questions, please ask us! Routines that are entered in the wrong Category are subject to a deduction of 25 points in that number’s final score. Again, PLEASE KNOW THESE RULES. It is the Teacher's responsibility to enter correctly. With the exception of Teacher Features, we do not allow any Dance Teacher on the dance floor during any performance. Teachers may assist the little ones (3-5 Age Division only) backstage, but may not “prompt” any of their Dancers during performances. Teachers may “warm up” Dancers in the dressing areas, however, there is no rehearsing at the Hotel. Routines that are Ballet, Lyrical or Modern - Classical or Contemporary. Flat slippers or Pointe. Props are permitted. Lifts are permitted as well as floor work and “tumbling-type” moves are allowed. No vocalization of any kind. Lyrical routines with Acrobatics (Handsprings, Aerials, Acro passes) enter either Tap/Musical Theatre OR Variety Arts/Acro/Ethnic Categories. All Jazz Styles - from “Show Jazz” to Hip-Hop. We will allow “tumbling- type” moves such as Cartwheels, Somersaults, Handstands, Walkovers, along with Jazz floor work and Lifts that may have a “head over heels” coming in or out of the Lift. Routines with Back or Front Handsprings, Aerials, Acro passes and Contortionist work enter either Tap/Musical Theatre OR Variety Arts/ Acro/Ethnic. Props are permitted. No vocalization of any kind. This Category is for all TAP routines - however, “Clogging” should enter the Ethnic Category. All styles of “Song & Dance” and Musical Theatre routines that includes singing, mouthing of words or lip sync. Props are allowed (in all Categories now.) Routines with “Acro” may also enter here. Remember that this Category and the Variety Arts/Acro/Ethnic Category are the TWO Categories that allow both vocalization and Acro. This is the Category for ANY dance routines with Acrobatic Tricks or Contortionist work. All Ethnic performances including but not limited to National Folkloric Cultural routines (for example: Armenian, Irish, Mexican, Spanish, Chinese, etc.). Props are permitted and you may now vocalize in this Variety Category as well as in the Tap/ Musical Theatre Category. Age divisions: “9-11”, “12-14”, “15-17” and “18 & Up” are the only divisions eligible. This must be “Student Choreography” with no Teacher assistance allowed. We must trust the honesty of all entries in this Category. There can be no repetition of musical selections from other routines entered from your Studio and no repetition of major dance combinations. Any dance style is permitted. You may perform a Solo, Duo/Trio, or Group number. Enter by the oldest performer in the number. All Ages, Categories, Ability Levels and Sections are eligible to enter. The Judges will critique the costume while you are posing. They look at the construction, uniqueness, stage appeal and appropriateness of the costume(s). You then perform the number (repeated for this Category). This is an additional chance to perform, and is especially economical for Duo/ Trio and Group performances. This is the only Category in which costumes are judged. This is an Open Category for Student Dancers (NOT TEACHERS) where at least one Dancer in the routine is over 39 years of age. This Category includes all Ability Levels and dance styles. Performances include Solos, Duo/Trios and Groups. A chance for the Teacher to perform! As in other Special Categories, anything goes and Teachers may perform Solo, or as part of a Duo/Trio or Group, with Students of any age, or with other Teachers. This is the only performance Category in which Dance Teachers may dance. Props are allowed in ALL Categories. A Prop is anything not worn on the body as part of the costume such as a hand- held hat, a cane, a chair, or any piece of costume that is removed during the routine. Props must come on with the performance, and not require extensive setup. No equipment or Props that require electricity, or that we consider hazardous (fire, smoke or fog devices, knives, throwing of confetti or glitter, etc.) nor Live Props of any kind is allowed. The dance floor area must be in the same condition after your performances as before. Tumbling-type moves are allowed in every Category and include Cartwheels, Somersaults, Handstands, Walkovers, along with floor work and Lifts that may have a “head over heels” coming in or out of the Lift. We define “Acro” as Handsprings, Aerials, Acro passes and Contortionist work. Routines with these “Acro” moves now have TWO Categories to enter - Tap/Musical Theatre Category or the Variety Arts/Acro/Ethnic Category. The age of the Participant is based on the event date. Each Duo/Trio and Group entry is entered by the age of the oldest Participant in that number. DO NOT AVERAGE. The Ability Level is based on the event date. A Dancer's level in Solos must be entered with consistent abilities in Ballet/ Lyrical/Modern, Jazz/Hip-Hop, Tap/Musical Theatre, and Variety Arts/Acro/Ethnic (whichever is HIGHEST). Each Duo/Trio and Group's Ability Level is that of the Participant with the highest Ability Level in that number. DO NOT AVERAGE. All music needs to be on a good-quality CD. Only one song per CD. The performance number should be written on the CD but do not tape anything to the CD. Affix your ILD music label to the CD case or sleeve - not on the CD itself, Please do not have any other labels or numbers written on your CD or cases. Please make sure your music is cued-up at the beginning of Track 1 to start immediately. Teachers and Dancers must have a backup available. Please have your backup music with you or your Studio representative in case it’s suddenly needed. Backup music may be provided digitally on a thumb drive or on your telephone with your adapter for a headphone jack. Teachers must time their music in advance to make certain that it does not exceed our limits. (Maximum 3 minutes for all Categories except Production Numbers which may be up-to 7 minutes. See below for EXTENDED TIME option.) Studios may not use the same piece of music more than once EXCEPT when entering Costume. Any performance that exceeds the time limit will receive a substantial 25 point deduction. Again, Production Numbers must be under 7 minutes. All other routines must be under 3 minutes. All entrances to, and exits from the dance floor must not exceed 10 seconds. For us to accommodate a performance that desires to compete and exceeds our time limits, we will offer EXTENDED TIME (up to 4 1/2 minutes for all Categories and up to 9 minutes for Production Numbers.) An EXTENDED TIME fee of $50 per routine is offered. This fee needs to be paid in advance through our office or at the show in advance BEFORE the Competition begins in order to be announced and avoid any deduction. We have Performers’ Ribbons for every Dancer! For Ballet/Lyrical/Modern, Jazz/Hip-Hop, Tap/Musical Theatre, and Variety Arts/Acro/ Ethnic entries, we award First Place Trophies and 2nd and 3rd Place Rosettes for each Age, under each Ability Level entered in each section. There are Grand Sweepstakes Trophies (1st, 2nd & 3rd Overall Highest Score) for each Age group. In Student Choreography, Teacher Features, Costume, Forty Plus and Production Numbers Categories, we award 1st, 2nd and 3rd Place Trophies. We offer FOUR special Overall Group Trophies for Beginning, Elementary, Junior and Senior Groups with $100 cash prize for each Ability Level. 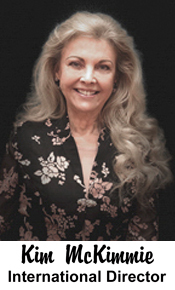 Judges will base their decisions in all Categories (except Costume) on: Stage Presence, Originality of Material, Technique, Style and Execution. They are looking at the total entertainment value and dance skills exhibited in each routine. Please remember that routines entered in the wrong Category will receive a substantial 25 point deduction (we do NOT disqualify routines) and the Judges' decisions are final. At the end of the Competition, we also give a “Teacher's Award” for outstanding participation, and an “Excellence Award” for outstanding performance. A Dancer will be named Junior OR Senior Sweetheart and receive Title and Trophy. We are not producing a “Sweetheart Of The Year Pageant” nor Dance Training Intensive this Season. In addition, one special routine will receive the “Best Of Show” title and $100 cash prize chosen by the Show Director for exemplifying exceptional creativity along with the LOVE of DANCE. One Teacher will be awarded “Best Musicality” title and $100 cash prize for choreography and adaptation of a routine to an inspiring and outstanding musical selection. After final awards are given, Teachers may then pick up the Judges' score and comments sheets. It is necessary to charge a $20 fee for each late entry as well as for omissions and changes made at your request. This includes changes made with our office or at the show. There is no refund due to cancellation for any reason and no “substitution” of Dancers. Please read all the Rules and Regulations and also the Entry Form in order to avoid any change fees. Once submitted, online entries are unable to be modified. Please call our office to make changes up to 10 days before the event date. Only Cash will be accepted at the show - no checks or credit cards for late adds or changes. Please keep in mind that many ILD Competition cities do fill up (sold out) well in advance of the 30 day entry due date. WE HAVE NO RESTRICTIONS ON A DANCER'S NUMBER OF ENTRIES. Dancers may enter several routines in the same Category (and compete against themselves.) Dancers may also enter multiple Cities with the same routines and/or with new ones. Routines from previous years are eligible for re-entry. We suggest that copies of your entries be made before mailing. (Online registration entries receive a summary page to print.) Use overnight mail when sending entries and fees. Online entry fees are to be mailed the NEXT DAY after submitting. About 10 days before the show date, a complete Confirmation Packet is emailed to all Participating Studios (and to Independents.) It includes the order of performances, entry numbers, CD label details, time schedule and additional information to pass on to Parents and Students. 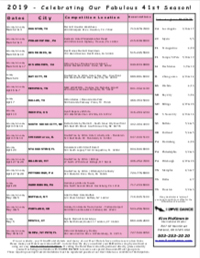 Hotel information is listed on the Season Schedule and our website. Anyone requiring overnight accommodations must be registered guests at our Host Hotel as a condition of participation. Although we provide dressing room facilities, your guest room is the best place for storage of personal items. Since we require that all out-of-town participants stay at our Host Hotel, please make reservations before or on the same day that you register. 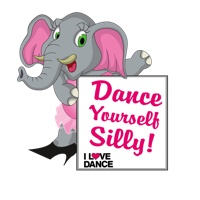 I LOVE DANCE participants receive our special guest room rate, but rooms at our Special “ILD” rate are limited, and Hotels have cut-off dates. Should any Host Hotel be “sold out”, you’ll need to call the ILD office for the Official Over-flow Hotel. At the Hotel, should any Studio or participant behave with egregious disregard for sportsmanship and our rules, they will be escorted from the Hotel premises with no refunds. Check the performance time schedule sent in your Confirmation Packet for opening and starting times. Teachers must register within 15 minutes of door opening and turn in all CD’s for the day backstage at that time. We cannot accept music or program changes after the show has begun. When Teachers (NOT a substitute) check in, they are given a name badge and a complimentary program book. Please be confident, that if a Director or Teacher is not available to attend, we will do everything necessary to assure the comfort of their Students and Parents in their absence. A list of Dancers for each day is at the registration table. Dancers must register at least one hour prior to the start of their performances and are admitted free of charge on the day(s) they perform as seating allows. Each day, general admission tickets (which INCLUDES a program book as supplies last) may be purchased at the door ($5.00 each – regardless of age, and we suggest that Children under the age of Three not attend — PLEASE DO NOT BRING INFANTS — this is a Dance Competition with long hours.) Throughout the day, concessions are open with souvenirs, dance supplies, trophies and rosettes available. You'll find I LOVE DANCE to be a well-organized, professional Dance Festival. We offer a fun and exciting learning experience, as well as a most enjoyable show.